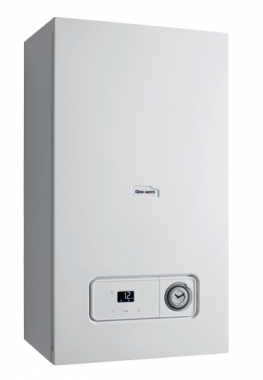 The Easicom 3 25s System gas boiler is a compact, condensing, wall mounted unit that has been designed and manufactured by Glow-worm. This is a highly efficient unit that comes with an efficiency rating of 89.7% and ErP A rating. With an output rating of 25kW, this boiler is perfectly suited to larger homes with 2 or more bathrooms that have a higher demand for heating and hot water. This boiler comes with a variety of features such as the unit coming with an aluminium heat exchanger allowing you to have excellent heating for you and your home. You can have maximum control over the boiler thanks to its easy to programme bright LCD Display, optional Glow-worm advance controls, a high-quality automotive grade aluminium heat exchanger and it’s an exceptionally quiet unit that will reduce your energy bills. With this being a System boiler it directly heats your central heating system and hot water for a storage cylinder. Most of the important parts of the hot water and heating system, such as the pump and expansion vessel are built into the unit, making it quicker and cleaner to install. This also means that you get a faster response to demand for heating and hot water, plus you don’t need to have a feed and expansion tank in the loft. Available with a 4 year parts and labour warranty, with the option to upgrade to a longer warranty if installed by a Glow-worm installer, you’ll have the peace of mind that this unit won’t let you down.